After posting up in the intro section am deeply chuffed to report my poor neglected beastie passed MOT after receiving some long overdue love. 4. F&R brake fluid, pads, calipers strip down, seals, braided hoses - Wezmoto aka Hel. 5. Total carb strip, ultrasonic carb clean, full Factory Pro kit including emulsion tubes (as jets, tubes and needles were all badly pitted / corroded), all carb seals & gaskets. 11. Sandy bike spares 2-1-2 exhaust system with the optional baffles. Ahem. Recommended - lovely sound to them. So after some hiccups in the initial setting up of the F-pro kit it's running better than even when I bought it. Matt & Mike at Harpers have been absolute stars. Very freindly, thorough and experienced guys and very fair prices too. Can't argue at £45 to strip, clean, inspect and re-build both carbs. I ordered all the bits from Wemoto, flea-bay etc & they did all the work at my place - and all done in a couple of days at way less than main dealer prices. 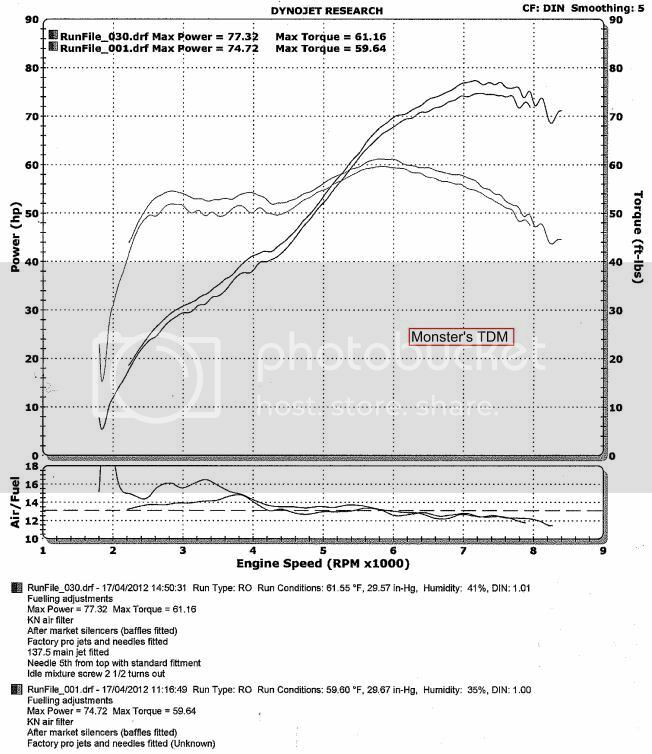 Power curve is healthy enough on the Dyno and pulls like a train on the road. Looks like you're on to a winner there. I Really like that color scheme! Edited by TDMick, 20 April 2012 - 12:10 am. 2004 Galaxy Blue. Owned since 486 miles, now on 53K.Renthal 755 bars and cross brace in blue, Oxford heated grips, DL650 hand guards, Double Bubble screen, Scorpion Rad guard, Gel pad insert, HLD undertray, Angry Badger tailtidy, Conti RA2s, Givi E21s and E46 topbox , PC3, Remus Revolutions. Check out http://www.hotcoldground.co.uk we're really rather good! 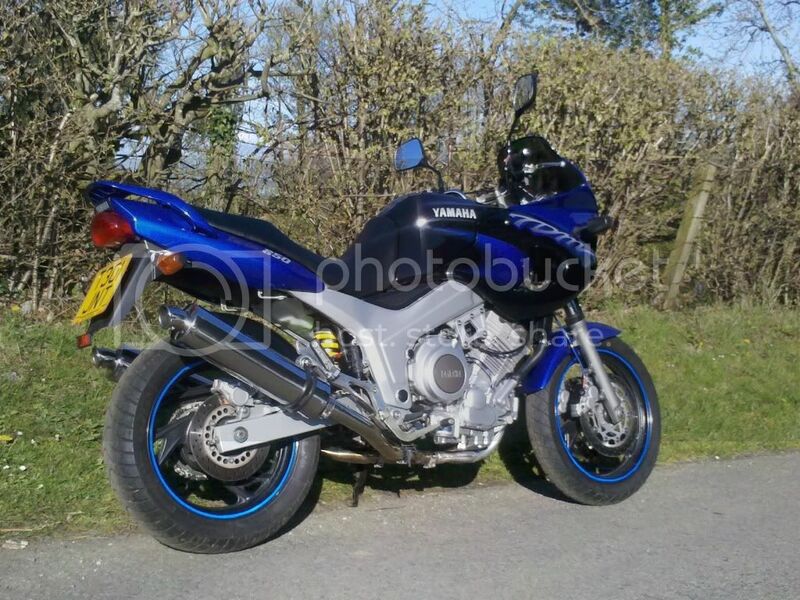 Great price on the carb clean and the bike looks a cracker ! I'm a tad surprised at the flattish torque curve, although it does seem to kick in early. BHP's good. EDIT: I was comparing the torque curve to that of my owd mk1, the mk2 is as yours is. Edited by Studley Ramrod, 20 April 2012 - 10:41 am. That is a very nice colour scheme ! Nice job Monster, loverly lookin' boike. 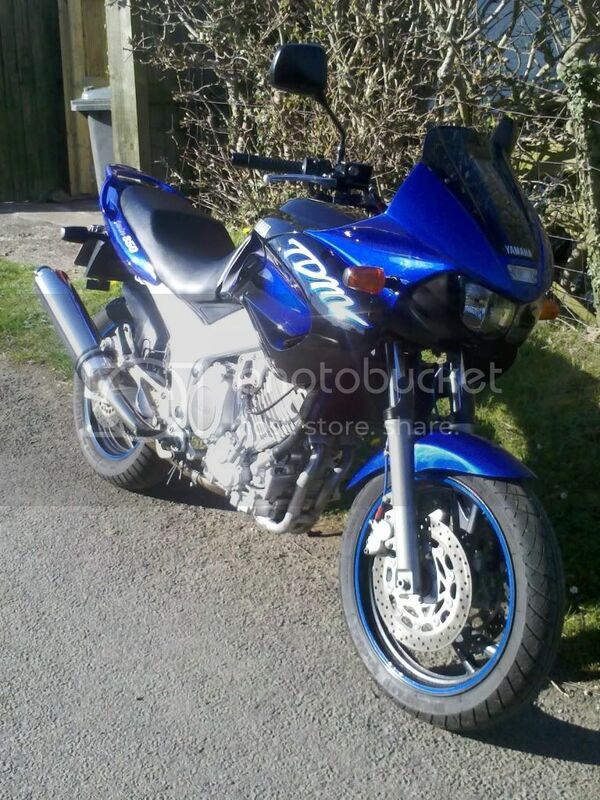 And thanks for the recommendations, my XTZ750 carbs needs some TLC and that's a very good price that Harpers charge. Cheers for the kind comment guys. If I figure out how to post vids on You Tube I may get round to posting up a link so folk can hear the exhaust. Very similar to the German Cobra pipes on there I think if yu search from TDM 850 Cobra. But a third of the price. Can't fault their build quality either. Definitely seems to be pulling stronger than I remember it doing stock - especially rolling on from low revs. Maybe that's the emulsion tubes - don't know. I'll monitor mpg and update post in due course. Regarding item 14: If I get 50 then I reckon Raspberry Pavlova. 55 and it's Eton Mess. 60+ would be large sticky toffee pud with double cream. One of the nicer 850's I've seen. Total carb strip, ultrasonic carb clean, full Factory Pro kit including emulsion tubes (as jets, tubes and needles were all badly pitted / corroded), all carb seals & gaskets. Can I ask where you ordered the tubes etc for your bike? Are there any other places selling them? I now know Staightline do FPro kits too - probably cheaper if they have a kit in stock - if not there's usually a few weeks wait. Very much so. Thanks for that ! Edited by Snorvey, 22 April 2012 - 08:32 pm. 49 mpg on a very vigorous run to Glastonbury yesterday. Bugger it - I'm having a puddin' anyways. Nice work! Looks like you brought the old dog back to life for sure.